My plan for “cleaning up” was to send people home with products … yeah … um … no. That plan only goes so far. So when my bathrooms began to resemble really disorganized salon spaces and my vanity looked like a Sephora beauty counter, it was time to organize all the beauty and grooming products. After all, it’s really difficult to write a review for a product if you can’t find it, not to mention the frustration of finding an amazing lip gloss and losing it in the abyss of drawer or makeup bag. Since I’d really let things get out of hand and am always pressed for time, I needed a highly efficient plan to whip everything back into shape. If you’re like me, you probably have a difficult time discarding beauty products. Tip One: Grab a friend who will be a bulldog about getting you to depart with useless products. My friend Bryne is a Godsend. She stood right next to me, throughout this process, never allowing me to waiver from my mission. When you are a true makeup junkie, making the commitment to truly organize your makeup stash can be overwhelming. Your best bet is to call in your bestie for backup. How do you decide what should stay and what goes? If you haven’t used a product in six months, get rid of it! During this process, remember to be kind to the planet; remove the product from its container and recycle the container of you can. This also the perfect time to discard expired makeup. Check out “When to Throw Away Your Makeup” for makeup expiration guidelines. Once you’ve endured that daunting task out 86ing your prized makeup cache, rethink your products. Multi-use products like BB and CC creams, and lip/cheek stains do double-duty and use half of the space! Check out “BB and CC Cream Break Down” and “7 Must-Have Beauty Buys” for a guide to time and space saving products! Most likely, you’re going to still have a plethora of products … now it’s time to separate them out. Separate your eyeshadows, eye pencils, lipsticks, lip pencils, lip glosses, and makeup tools into their own piles. This is also perfect time for a second evaluation of what you need to toss. No matter how much space you have, it never seems to be enough. 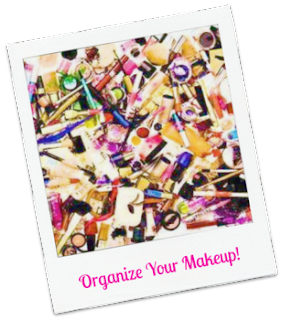 By organizing your makeup and beauty essentials, you will create space. And with so many creative, pretty ways to accomplish this, those beauty essentials can be come part of your décor. Check out “DIY Makeup Brush Holder” for inspiration. ©2013 Yvonne P. Mazzulo, aka, The Makeup Examiner, All rights reserved.